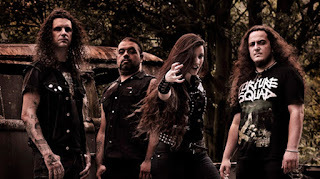 Torture Squad, whose name is inspired by American thrashers Scared Reich's track "Death Squad", is a Brazilian band who play a mix of thrash and death metal. Far Beyond Existence is their seventh studio album; their first under Brutal Records. It is also their first full length release with their current signer Mayra "Unread" Puertas, as well as Rene Simionato on guitar. Although, they both previously appeared on the Torture Squad EP Return of Evil. The sound of the band is richly old school evoking a sound that mixes thrash bands like Kreator and Sodom with death masters like Death and Entombed. The result is a fiery and energetic whirlwind of extreme and battering music and the most exciting release from an underground band, this year. so far. Practically every song is a winner, here. It opens with the thrashing and pummeling "Don't Cross My Path". An ominous intro goes into a battering drum ladden sound accompanied by chainsaw guitars and crunching riffs for the song "No Fate". "Blood Sacrifice"'s serene intro lulls one into a peaceful and mysterious feel only to build up to a full death metal assault with shredding guitars and battering drums, which, in turn, are perfectly accompanied by Puertas menacing and anger filled growl. "Hate" brings the blast-beats and fast riffing to the forefront with a shark like ferocity that punishes one into submission. "Hero For The Ages" has an amazing thrash metal intro that recalls Anthrax and Slayer. It builds into a furious track that is my favorite on the album. The band's strong musical talent really drives the album to be a success of fury and fire. The production is good and you can really hear guitars clearly and every cymbal and hit on the drum kit. It really helps to highlight the band's driving sound. I also absolutely love Puertas' signing, She has an awesome death metal growl that she can excellently change in depth and pitch, adding the final addition of brutality. The dark and beautiful artwork comes courtesy of Rafael Tavares and helps to drive this album to the extreme metal stratosphere of awesomeness. Far Beyond Existence is ripping album that marks one of the most exciting from the underground in recent memory. It proves Torture Squad as a force to be reckoned with in extreme metal. A blistering mix of raging thrash and punishing death metal, it is an album that you need to purchase when it comes out late next month.